Virginia Beach is a popular summer family destination and where the family goes, the family pet goes too. 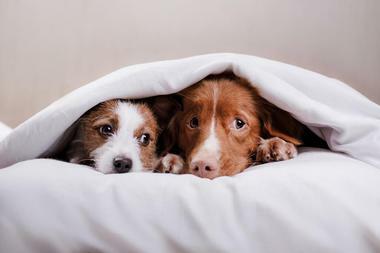 Fortunately, many Virginia Beach hotels are ready and willing to accommodate our beloved furry friends, sometimes free of charge and sometimes for a small additional fee. 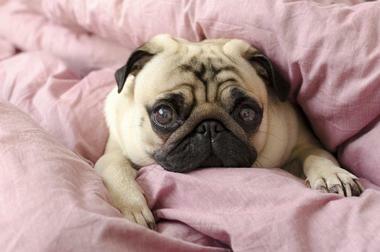 Virginia Beach hotels do not discriminate against the size of your pet, but most accept only one pet per room. 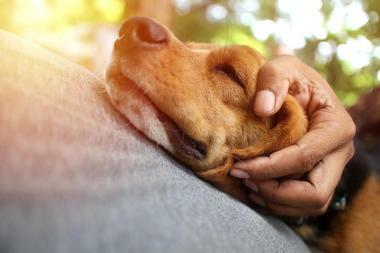 You will be responsible for any damage your pet does and you will have to check with each hotel whether pets are allowed in all parts of the hotel, such as the swimming pool. Keep in mind that dogs are allowed on the beach in Virginia Beach before Memorial Day and after Labor Day, but during the summer season they may only visit the beach north of 42nd Street and south of the Sandbridge area. Dogs must be on a leash at all times. Ambassadors Inn and Suites is a modern 97-room hotel located next to the Virginia Beach Convention Center and just a few blocks from the beach and the boardwalk. Most Virginia Beach attractions are just a short drive away, such as the Virginia Aquarium and Marine Science Center. The clean, contemporary rooms and suites all have microwaves, mini-fridges, cable TV, hairdryers, and access to free Wi-Fi. Many rooms have small balconies. The hotel has a small lounge in the lobby, a 24-hour front desk, and a nice swimming pool outdoors. Pets are welcome and there is a free parking. 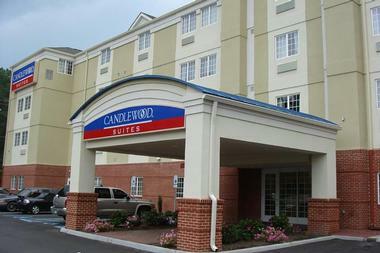 Candlewood Suites is a four-story suite-only centrally located hotel in Virginia Beach with 83 modern and well-equipped suites, a short walk to all the restaurants and shops, and a short drive to Norfolk Botanical Garden. The spacious, relaxed, and nicely furnished suites have fully equipped kitchens with fridges, microwaves, and dishwashers. Suites have modern en suite bathrooms, large desks, flat-screen TVs, free Wi-Fi, and CD/DVD players. Some suites have comfortable recliners. Guests enjoy access to a fitness center, a business center, laundry facilities, a gazebo/grill area outside, and a convenience store. Pets are welcome for an additional fee. Parking is free. 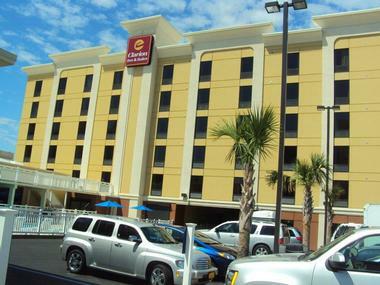 Whether you are in Virginia Beach on vacation or for business, you will find everything you need at Clarion Inn & Suites. 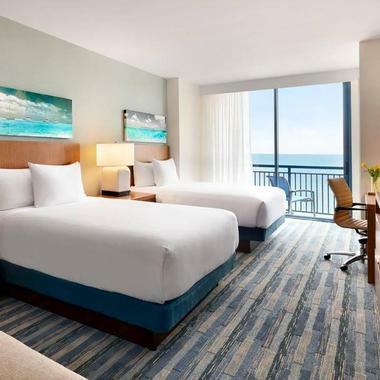 Located only a block from the beach and boardwalk, this modern hotel offers bright, spacious, nicely decorated rooms and suites, some with views of the ocean. Other Virginia Beach attractions like the Museum of Contemporary Art, and the Virginia Aquarium and Marine Science Centre are just a short drive away. 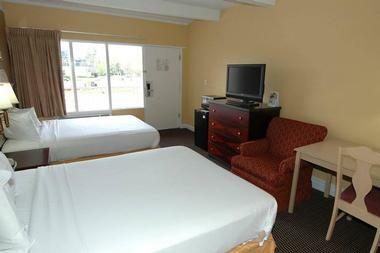 All rooms have free Wi-Fi, flat-screen TVs, mini-fridges, coffeemakers, and microwaves. Some also have pull-out sofas. The spacious suites have living rooms and desks, and some have pillow-top mattresses and convertible sofas. Guests enjoy complimentary buffet breakfast, an exercise room, a business center, laundry facilities, and an outdoor swimming pool. On weekends and holidays, a tiki bar serves interesting cocktails and other drinks. Dogs are welcome. With its location right next to the Virginia Beach Convention Center and with ten meeting rooms covering 12, 000 square feet, DoubleTree by Hilton is a perfect destination for those attending meetings and conferences. Not that tourists are neglected: There is a free shuttle bus to the beach during the season. This modern hotel has spacious and brightly colored rooms with custom beds, flat-screen cable TVs, free Wi-Fi, and coffeemakers. Suites add mini-fridges and living areas, and the three-room Presidential Suite has a wet bar. The guests have access to a colorful on-site restaurant, a fitness center, an indoor pool that opens to the outdoor deck, and a spacious, nicely decorated lounge area. 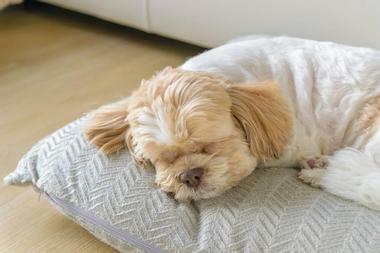 DoubleTree is pet-friendly. You do not have to plan a long stay in Virginia Beach in order to enjoy the homeliness and convenience of the Extended Stay America hotel. This modern place is located less than 2 miles from Mount Trashmore Park and about 7 miles from the Sportplex. All spacious suites have a fully equipped kitchen with a stove, microwave, and fridge as well as desks, ergonomic chairs, free Wi-fi, and flat-screen TVs. The guests enjoy a complimentary grab-and-go breakfast that includes coffee, tea, breakfast bars, cereals, and muffins. The hotel has coin-operated laundry facilities and a 24-hour front desk. Some rooms are pet-friendly. There is free parking. Homewood Suites is an extended-stay hotel near Norfolk International Airport and a short drive from Virginia Beach’s lovely sandy beaches. 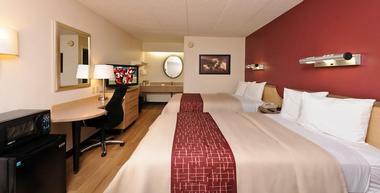 This large, modern all-suite hotel offers exceptional comfort for long-term guests. All rooms are air-conditioned and have fully equipped kitchens and separate nicely furnished dining, living, and sleeping areas. All have free Wi-Fi and flat-screen TVs. They range in size from studios to two-bedroom suites. Guests enjoy free hot breakfast and complimentary dinner and drinks Monday to Thursday. There is a business center, a coin laundry facility, a gym, an indoor pool, and a convenience store. A complimentary shuttle is provided within a 5-mile radius. Pets are welcome. You can’t get any closer to the beach when staying in Virginia Beach than at Hyatt House. Located right on the boardwalk with spectacular views of the beach and the ocean, this large, modern luxury hotel offers ultimate comfort in the middle of all that Virginia Beach has to offer. All 156 spacious and nicely decorated rooms have flat-screen TVs, free Wi-Fi, and balconies. Many rooms have views of the ocean. Studios have sofas and small but well-equipped kitchens, while suites have separate living room areas. Guests enjoy complimentary breakfast and free parking. The hotel’s oceanfront H Bar offers drinks and food in the evening and there is an indoor swimming pool, a gym, and 1,943 square feet of event space. The hotel is pet-friendly. 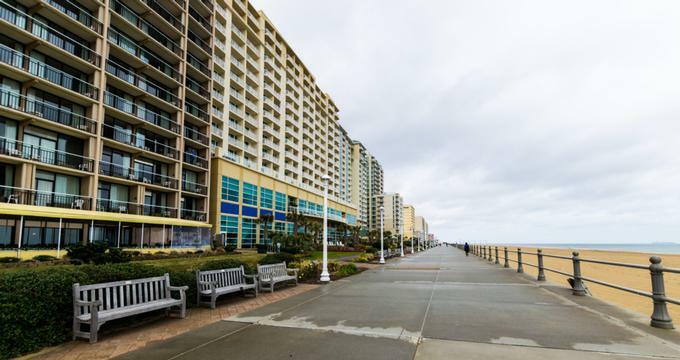 Located just a block from the beach and boardwalk, La Quinta Inn & Suites offers comfortable, modern lodging a short drive from the Virginia Beach Convention Center and the airport. The rooms are relaxed and streamlined, with incredibly comfortable pillow-top mattresses, mini-fridges, flat-screen TVs, microwaves, free Wi-Fi, and coffeemakers. Suites have separate cozy living areas. All children under the age of 18 stay free of charge if they share a bed with a family member. Guests enjoy the use of the indoor and outdoor swimming pools, a gym, and a complimentary continental breakfast. Parking is free. 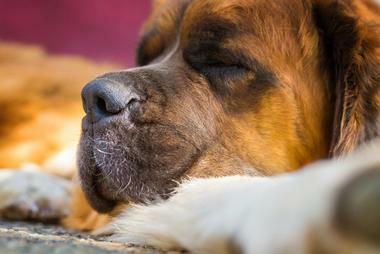 La Quinta Inn & Suites is pet-friendly. Motel 6 in Virginia Beach is located about halfway between the beach and the airport, just off Interstate 64. This budget-friendly lodging offers great value with simple but spacious rooms with en suite bathrooms, free Wi-Fi, and TVs. Some rooms have desks and/or sitting areas. Children under the age of 17 stay free of charge. Pets are also welcome. Guests enjoy free morning coffee and parking, and there is an outdoor seasonal swimming pool, a 24-hour front desk, and a coin-operated laundry facility. All Virginia Beach attractions, such as the Pembroke Mall and the Virginia Beach Amphitheater, are just a short drive away. 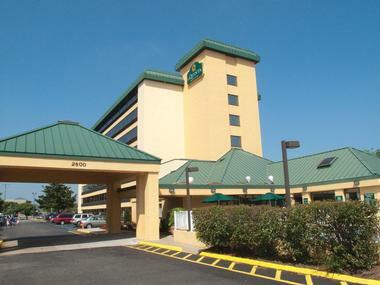 Red Roof Inn is a modern hotel located just off Interstate 284, about 20 km from the Virginia Beach boardwalk and the beach. The spacious, nicely decorated colorful rooms have flat-screen TVs and free Wi-Fi and some also have a mini-fridge and a microwave. A hotel safe is available for a small additional fee. All rooms are smoke-free, and pets are welcome. The guests have the use of a seasonal outdoor swimming pool, a small snack bar, and a 24-hour reception. There is a restaurant just across the road from the hotel. All Virginia Beach attractions, such as the Virginia Beach Convention Center and the Veterans United Home Loans Amphitheater at Virginia Beach, are just a short drive away. As you approach Residence Inn in Virginia Beach and enter its large, modern lobby, you could be anywhere in the world. It is a Marriott, after all. But once you get to your spacious one-bedroom suite and look through the floor-to-ceiling windows at the endless expanse of the ocean, you will see what makes this Virginia Beach hotel so special. Located mere steps from the boardwalk and the beach, along the popular bike path, Residence Inn is a modern and very nicely decorated prolonged-stay lodging with all the amenities contemporary guests require. All rooms have en suite bathrooms with a bath tub, free Wi-Fi, large-screen TVs, and desks, and some have separate living and sitting areas, a desk, and a balcony overlooking the ocean. Guests have the use of a common well-equipped kitchen, an indoor swimming pool, a gym, a business center, and a laundry facility. The hotel is pet-friendly. 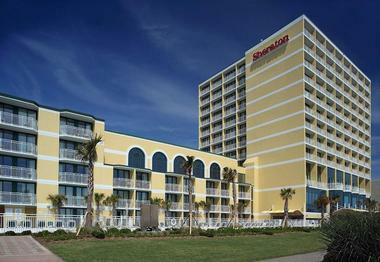 Sheraton Virginia Beach Oceanfront Hotel is located right on Virginia Beach’s famous boardwalk, with direct access to the beach and close to all the city’s attractions, such as the Virginia Aquarium and Marine Science Center and the Cape Henry Lighthouse. Rooms are spacious and comfortable, with superb Sheraton Sweet Sleeper beds, desks with ergonomic chairs, free Wi-Fi, mini-fridges, flat-screen TVs, and coffeemakers. Many rooms have balconies with beautiful ocean or pool views. Upgraded rooms have whirlpool tubs, and suites have living areas with sofas. Guests enjoy many amenities such as complimentary breakfast, two swimming pools, a state-of-the-art gym, a bar, and a pleasant waterside restaurant. The hotel is pet-friendly. 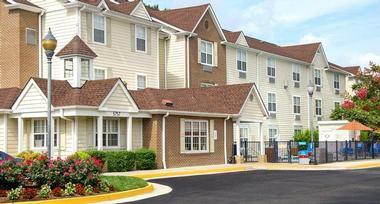 There is a surprising homey, beachy feel to the TownePlace Suites by Marriott in Virginia Beach. 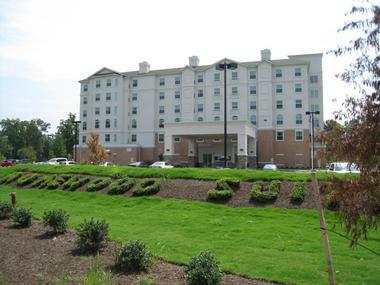 Located about 6 miles from Norfolk International Airport, this extended-stay hotel offers spacious, modern rooms that range in size from studios to two-bedroom suites. All are equipped with free Wi-Fi, flat-screen TVs, desks with ergonomic chairs, a fully equipped kitchen, and a small living area with a pull-out sofa. The guests have free use of the living and dining common area and can prepare their own meals in the hotel’s barbecue facility. 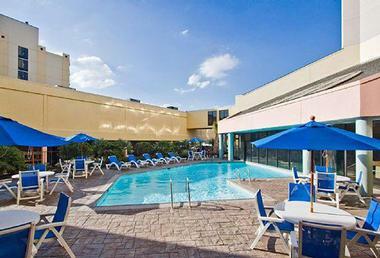 The hotel has an outdoor seasonal swimming pool, a gym, a laundry facility, and free parking. There is a complimentary continental breakfast. Pets are welcome. Travelodge by Wyndham is located just steps from Virginia Beach’s magnificent beach and a short drive from the city’s major attractions such as First Landing State Park and the iconic 18th century Cape Henry Lighthouse. Rooms are modern, with traditional decor and all modern amenities such as cable TV, free Wi-Fi, coffeemakers, microwaves, and mini-fridges. Children under the age of 17 stay free of charge, and pets are welcome for an additional fee. The guests enjoy a free continental breakfast, a seasonal swimming pool, and free parking. There is a free coffee and tea station in the hotel’s common area. Located right on the edge of the beach, Windham Virginia Beach is a modern hotel with elegant, well-decorated rooms and all modern amenities such as free Wi-Fi, flat-screen TVs, coffeemakers, and mini-fridges. Some rooms have whirlpool tubs and/or balconies and patios. Many rooms have magnificent ocean views. Suites have kitchenettes and living areas, and upgraded suites have wet bars and separate living rooms. The hotel offers a range of facilities such as indoor and outdoor pools, a local free shuttle, a fitness center, a business center with meeting rooms, and the popular Surf Club Ocean Grille restaurant with a cozy bar and outdoor seating by the fire pit. The hotel is pet-friendly.